Test for function and proper location on each floor. Report on the condition if detectors appear to be more than 10 years old. Note lack of carbon monoxide detectors, especially in garages. 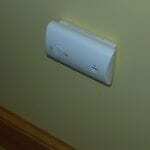 Make recommendation to install a carbon monoxide detector on each floor. Test for function and proper location on each floor and in each bedroom. Report on condition if detectors appear to be more than 10 years old. Check the polarity and grounding of receptacles within 6 feet of interior plumbing fixtures, all receptacles in garage, carport and exterior walls of inspected structure. 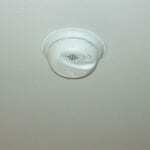 Inspect all GFCIs in kitchen, baths, laundry room and islands with water supply for proper wiring and operation. Make note of any lack of GFCIs. Observe the representative number of ceiling fans, lighting fixtures, switches and receptacles located inside the house, garage and on the dwelling’s exterior walls. Test devices for on/off function and insure receptacles are wired correctly. Note broken fixtures, cracked outlets, outlets with grounding plug broken off inside outlet and general condition of device. 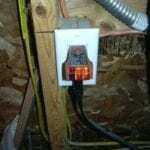 Inspect wiring throughout the distribution box and structure. Report on any unsafe wiring such as bare wires that are not terminated in a junction box properly, are close to a metal object, or are hanging where someone could come in contact with it. 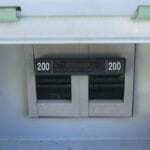 Inspect main distribution box and note any “Double Tap” circuits where two circuits are improperly wired to one breaker. Observe amperage of breaker and note improperly sized wires feeding circuits or devices. 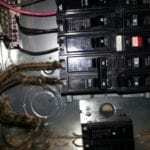 These issues are most commonly found in electrical boxes where it is obvious the homeowner has done the wiring or older homes that have unsafe wiring. State location of main and sub-panels. 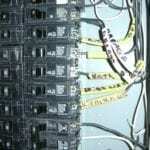 Remove covers and check for proper wiring. 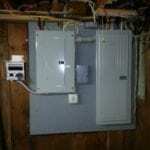 Look for double tap circuits, rust in or on the panel, the breakers and branch circuit wires. 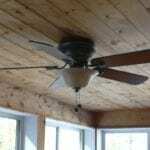 Check for use of proper screws on the panel and any defects in the panel. Note panels that have possible recalls for unsafe conditions. Describe amperage and location of main shutoff breaker. Make sure no breakers are present that are a higher amperage rating than the main to prevent the possibility of an overloaded circuit that has the potential to result in a fire or explosion. 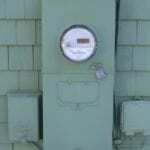 Check to make sure the service entrance conductors and meter is properly installed and secured to the structure. Inspection of a “Drip Loop” and grounding is noted.